The 2019 partypoker Mosconi Cup will take place at Mandalay Bay Resort, Las Vegas from Monday, November 25 until Thursday, November 28 with tickets on general sale at 10am PT (6pm GMT) on Wednesday, December 12. Matchroom Pool Club members can access an exclusive pre-sale from Tuesday, December 11. Mandalay Bay Resort played host to the 2017 partypoker Mosconi Cup in front of the biggest stateside crowd the tournament has witnessed. The 2019 US Open 9-Ball Championship will also take place at Mandalay Bay, Matchroom Multi Sport’s home of 9-ball in America. 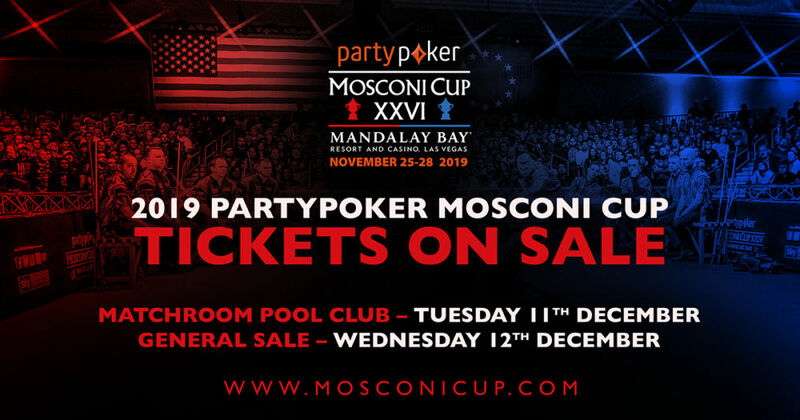 Ticket prices for the 2019 partypoker Mosconi Cup start at $48 per session for silver tickets with a four-day season ticket available at $161. Gold tickets are priced at $70 dollars per session and $239 for a season ticket. VIP Platinum packages are available at $255 per person per session or $950 for all four days. Gold seating is within rows four to seven. VIP Platinum packages include seating within the front three rows, a traditional breakfast buffet, unlimited beverages, a meet and greet with players and much more. All prices are face value which includes venue fee and local taxes. The only additional fees are Ticketing agency (AXS) Convenience Fees.